Facial Infusion generates a 30-day collagen production increase and is a wonderful option used to boost/speed the results of the Osmosis protocols. It is unique because it avoids damaging the epidermis by penetrating several high-dose active ingredients into the dermis through liposomal delivery. Facial Infusion enhances results for acne, aging, rosacea and hyperpigmentation and can be customized by adding powder blends and actives for increased correction. OSMOSIS FROM DR. BEN JOHNSON. SWiCH System: The signature SWiCH Dermal Rejuvenation System is a peel alternative that safely stimulates the Krebs cycle to enhance energy production and cell turnover. A scientific breakthrough that helps enhance mitochondrial function & restores skin to youthful appearance. A treatment that performs beyond the results achieved with non surgical peels. With this system it is possible to achieve repair of the skin without having to induce tissue damage. Clients considering this program must discontinue the use of Retin A or any AHA products 4 weeks prior. One treatment per month. Using glycolic acid, Retin A, or Renova in the last 2 weeks. Clients considering the SWiCH™ program must discontinue the use of Retin A, Renova and any AHA products prior to their treatment. The guidelines for timing Retin A or retinol use with SWiCH™ depends on individual skin type. Do not perform SWiCH™ treatments when clients are non-compliant with these guidelines, on any client with compromised skin of any type. Do not perform SWiCH™ treatments for a minimum of three months after a facelift or blepharolplasty. 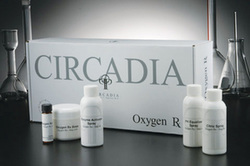 The Oxygen Rx Treatment can be used on any skin type. The germicidal action makes it extremely beneficial for acne. It reduces redness and soothes inflamed skin after just one treatment, leaving the skin smoother. Beneficial for Rosacea, Anti-aging and improves scars and lightens sun damage. Can be repeated as often as once a week(oxygen only) with enzyme treatment included it can be repeated once every other week. Microcurrent, a popular treatment for aging skin, uses low level electrical current to trigger the body’s natural skin enhancement chemicals at a cellular level, giving skin therapists an effective tool against the signs of skin aging. While alternative medicine practitioners use it for injury recovery, skin therapists note that it provides firming and toning benefits that continue to improve with subsequent treatments. Some clinical studies have shown that after twenty days of Microcurrent treatments, collagen and elastin production increases and blood circulation improves. Scientists have also found that Microcurrent facelift treatments trigger the body’s production of amino acids and Adenosine Triphosphate (ATP). Both of these accelerate cell repair and promote healthier cell production. Muscle Re-education, the process of lengthening or shortening muscles, is mostly related to the term “facial toning.” Sometimes referred to as MENS (Muscle Electrical Neural Stimulus or Minimal Electrical Neural Stimulus), Microcurrent re-programs the muscle fiber, allowing the muscle to lengthen or shorten depending on the direction of the application. The procedure sends a current to lift and re-educate muscles. Some machines used in Europe and in medical environments cause a muscle contraction. 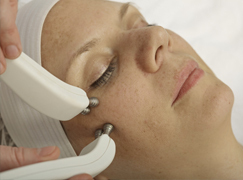 In the United States, if used by a professional skin therapist within their scope of practice, Microcurrent cannot cause a visible contraction. There is no actual muscle contraction, and probes allow the skin therapist to pick up the muscle and hold it in place for a few seconds. The current stimulates Adenosine Triphosphate (ATP), a nucleotide that can accumulate in the muscles themselves. It is vital that the therapist knows all 32 of the muscles on the face, their origins, their insertions and their bellies. When a muscle lengthens or shortens, the skin lifts and firms. Working from the belly of the muscle outward will have a lengthening effect on muscles that have become increasingly contracted from years of making facial expressions. Working a muscle from the origin and insertion point inward will have a shortening effect that is necessary for those muscles that have become elongated over many years of age and gravity. Muscle Re-education uses micro amps (a very low concentration of electrical current), square wave technology and hertz. This makes the procedure significantly more comfortable for the client.